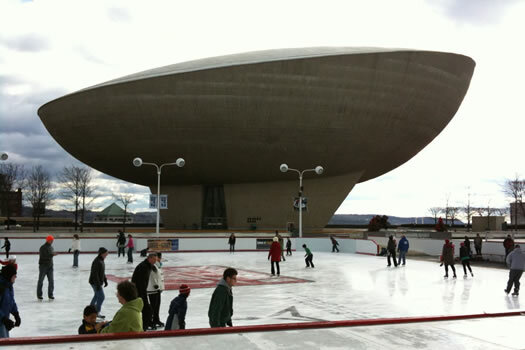 This weekend is the last chance for skating at the ESP for the season. The forecast for this weekend may have you breaking out the sunscreen and Bermuda shorts -- but resist the urge. Sure, 40 seems warm when it's been snot freezing cold, but unless you're up for a polar plunge, it's not swimsuit weather. After the jump, a few things to do on this lovely winter weekend. Got plans you don't see here? You know what to do. Drop them in the comment section so we can all see. And have a fantastic weekend. + RADICAL and friends' Coup D'Art exhibit at Upstate Artists Guild. + The Albany Institute of History and Art is open late with free admission. + The Albany Barn's Stage 1 Gallery is exhibiting works from its youth art contest. + The El Dorados are headlining at the Capital Swing Dance at 25 South Allen. + Jeff Strange's countdown to Saint Patrick's Day concert starts at 8pm at The University Club. When someone says they don't like musicals, and you want to change their mind, you take them to Man of La Mancha. The touring company of La Mancha-- the story of Don Quixote's quest for the impossible dream is making a stop at Proctors this weekend. Saturday at 2 pm and 8 pm. $20 - $70. The Mop & Bucket Company is back at Proctors Underground on Friday night with its TheaterSports competition -- in which teams of improvisors compete based on audience suggestions. (Think Whose Line is it Anyway?) Friday at 8pm - $14 / $6 students and seniors. The Oscar winner for best picture -- 12 Years a Slave, based on the story of Solomon Northup, a man from Saratoga Springs -- is back in some local theaters, including The Spectrum, the Saratoga Springs Bow Tie, the Crossgates Regal, and the Scotia Cinema. The Spectrum is also screening the Oscar-nominated live action and animated short films this weekend. It's Indiana Jones weekend at The Madison, with screenings of Raiders of the Lost Ark and Indiana Jones and the Temple of Doom. It's also Jan Thozomas weekend (the Travoltified name for John Travolta) at the Madison with screenings of Grease and Saturday Night Fever. Various times. If you like Sing-alongs, be advised that the Scotia Cinema is holding Frozen sing-alongs on Saturday and Sunday at 3pm. If you don't like sing-alongs, be advised that the Scotia Cinema is holding Frozen sing-alongs on Saturday and Sunday at 3 pm. Friday-Monday: The America East conference basketball tournament for both men's and women's teams is at the SEFCU Arena at UAlbany. The winners of the tournament will play in the NCAA tournament. On the women's side, the #1 seed Great Danes play Binghamton Friday at 6 pm. On the men's side, UAlbany plays UMBC Saturday at 2:15 pm. (They'll both play again Sunday if they win.) Note: The men's conference championship game isn't until Saturday, March 14 (because of TV). The State Museum's 60 from the 60s exhibit, featuring 60 prints from the 1960s by 10 of the most significant photographers of the decade, closes on Sunday. And heads-up -- the NYS Museum will be closed this Saturday. Wait -- ice cream? Yep. It's a harbinger of spring. The Snowman opens on Friday in Troy. The Mop & Bucket Company, Albany Institute, The Spectrum, and miSci advertise on AOA. FYI: Looks like the Deer Tick show is sold out.